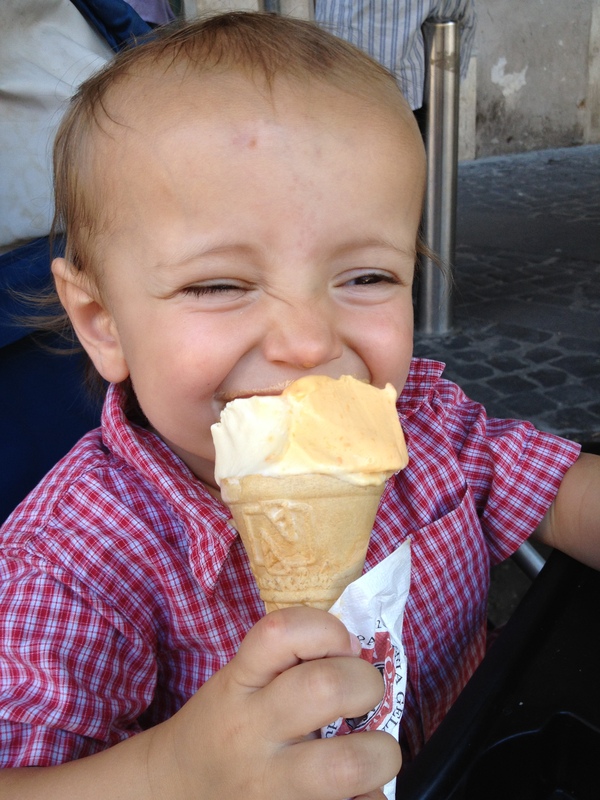 When I was in Italy, I had something I’d never eaten before: gelato. Mama and I had it every day (I think she had it twice a couple times, too, which she thinks I don’t know about). We ate gelato with pears and Nutella, gelato with basil and cantaloupe, gelato in cones, gelato in cups… I can’t even tell you all the kinds of gelato we had! Look how well I can hold a cone of gelati. 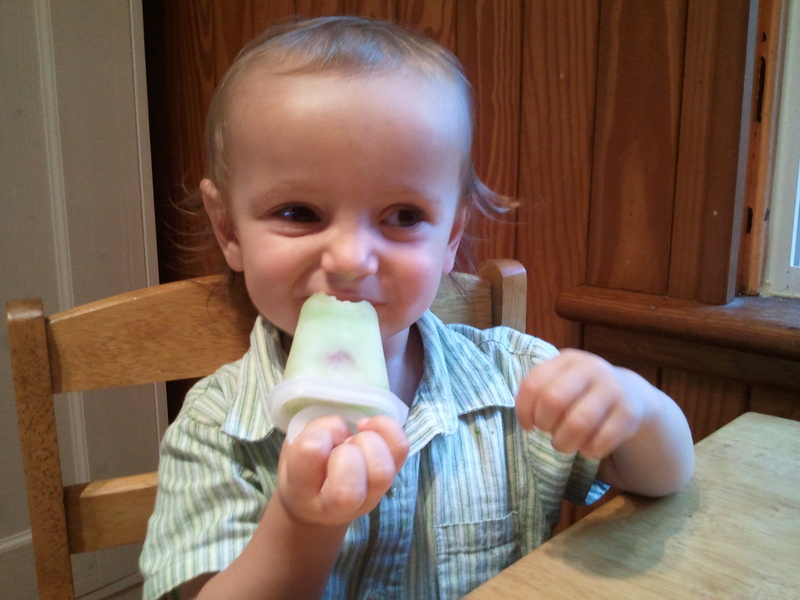 But now that we’re home, and it’s awfully hot outside, Mama’s kept it simple and made me popsicles. They’re so easy, even I could do it…but then again, I’m pretty handy in the kitchen. The only part I needed help with was making the simple syrup (hot!) and cutting the honeydew (knife!). After that, we pureed it in the blender, Mama poured the mixture into the popsicle molds, and then she put them in the freezer. Waiting until they were frozen would have been the toughest part, if I hadn’t had to go to bed. What I like about these popsicles is that I can bite them. They’re just a little bit crystally and not too hard. They’re sweet, but they mostly taste like the green melon. And I see that Mama snuck a little raspberry into each one that I have to munch may way down to. I also like that I can hold it by myself, which just means that I can offer it up to Mama (or Papa) for a taste. Just a taste, Mama. See the raspberry Mama hid in my popsicle? If you’re using a large fruit, like a honeydew or cantaloupe, peel, seed, and chop it into cubes. Smaller fruit, like berries, can be tossed in whole after being destemmed. If you’re using something like peaches, it’s really up to you if you want to peel them. Put the fruit into the blender and add the simple syrup. Puree until there are no more chunks of fruit, a minute or two. Again, if you want your popsicles less sweet, start with half the syrup, puree, then taste it. Mama says you need to have some sugar in it, though, otherwise the popsicles will freeze solid. Pour the puree into popsicle molds—but don’t fill them all the way. If you want, drop a tiny berry in at the bottom—it looks pretty, and it’s fun to get to! Seal up the pops and freeze until set, a few hours. We got exactly 18 pops from this mixture, and I’m working my way through them. Categories: Hits, With recipe | Tags: baby food, cooking, cooking with toddlers, fruit, popsicles, recipe | Permalink.